As the wave of global recession triggered by the financial crisis in the US has been exerting a big impact on Japanese economy, we organized a press tour to cover recession-proof internationally competitive and well-rated small and medium-sized companies located in Saitama. Twelve journalists from ten countries and regions including Germany, Italy, the UK, China, and South Korea joined the tour. Throughout the tour, many questions about the influence of and the measures against global recession were brought up by the journalists. Two manufacturers, KEISWI Inc. and SUMITA Optical Glsss Inc., said they were very apprehensive about this recession but in a period of economic slump, they would devote efforts to R&D and keep on making finest products ready for the time when the economy picks up. On the other hand, some companies in the food industry have been doing better because of the recession, some consumers tend to eat at home or buy prepared meals instead of dining out. In fact, COEDO Brewery has increased its profit at retail stores. First, Saitama Prefectural Government gave them a briefing on the characteristics of business in Saitama Prefecture and various support measures for business. 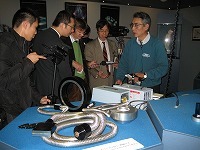 After the briefings, the journalists visited Saitama Industrial Technology Center (SAITEC) which was set up with the aim of encouraging small and medium-sized enterprises, and venture businesses. A venture company "Little Island", which produces a look-alike doll with artificial intelligence, which is located in SAITEC, made a presentation with the doll. After the visit to SAITEC, they had a chance to visit three recession-proof and well-rated small and medium-sized companies, KEISWI Inc., SUMITA Optical Glass Inc., and Kyodoshoji Corp. Ltd., COEDO Brewery to learn of their R&D development and their business spirit using craftsmanship. The first visit of the three companies visited was KEISWI Inc., which is a precision sheet metal processor specializing in making interior apparatus for airplanes and shinkansen bullet trains. In 2003 Mr. Keiichi Sugano, the president of the company, launched an original brand "AERO CONCEPT" producing briefcases and small goods such as card cases and key chains, taking advantage of his high skills in precision processing. Mr. Sugano's passion for his products and his high quality workmanship earned a good reputation all over the world. The participating journalists were also attracted by Mr. Sugano's personality and put a lot of questions to him. In the afternoon they visited SUMITA Optical Glass Ltd., which is known around the world as an optical fiber pioneer company. SUMITA dominates a market share of aspheric lenses, which are mainly used for digital cameras. With their motto, "R&D is vital" SUMITA has been developing high quality and many world-first products. 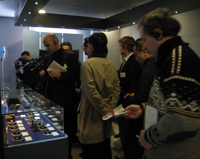 On the tour, the journalists also had a chance to see the demonstrations by the researchers in their factory. The last destination of the tour was COEDO Brewery. COEDO has been attracting worldwide attention with their outstanding "Beniaka" beer, which is made of Kawagoe sweet potato, a local specialty. COEDO invited a craftsman from the home of beer brewing, Germany, in order to fully acquire his technical skills of making craft beer. The journalists interviewed the beer meisters during the brewery tour and also enjoyed the taste of their premium beer. All five beers have received prizes at worldwide-known "International Taste & Quality Institute (iTQi)" and "Monde Selection" in the beer section.